Do you have drivers for x, y or z manufacturer? Device Doctor has drivers for most desktop, laptop and peripheral vendors out there and we're constantly adding more devices to our database. We also focus on providing comprehensive support for some vendors to help us reach every device out there, for example see our Toshiba drivers. Installing drivers will often require computer restart for the new drivers to load. In those cases it's always a good idea to use Device Doctor again and do another scan to download any other updates. Note, if you see the same driver you just updated show up in the scan again you don't have to reinstall it (see the next question for details). Sometimes Device Doctor can't tell if you have a driver installed or not, or it might have trouble finding the version of the driver you already have installed. This problem usually only occurs with chipset drivers. By default, Device Doctor will recommend the driver anyway in case you don't have it (better safe than sorry). If you have to, make a list of the drivers and versions you already have installed so you don't have to repeat downloads and installations. Installing a driver twice is not dangerous, but is unnecessary. Will Device Doctor make my games/video run better? Device Doctor will display each device needing an update individually, so you can pick and choose which drivers to download. Normally, it's not necessary to update devices you feel function perfectly well since new drivers can sometimes have bugs that old ones didn't. Generally speaking though, if you are experiencing any problems with a device, or with software interacting with that device then updating drivers is always the first step to fixing such problems. Can I use Device Doctor while disconnected from the internet? If you are not connected to the internet, Device Doctor will scan your computer for missing drivers and save the results to a portable file which you can transfer to another computer. Opening this file on a connected computer will allow you to download any missing drivers, move them to the original computer and install them. How do I uninstall Device Doctor? Click Start, select All Programs and find Device Doctor. Under the Device Doctor menu there is an Uninstall Device Doctor option. Click on that and follow the uninstall procedure. Driver file names are often misleading, since they usually contain more than just one driver version. For instance, if you have a driver that has "32" in the file name, it's most likely a 32-bit driver, but may also contain a 64-bit version, or a version for entirely different operating system. Device Doctor finds drivers based on the contents of the driver package itself and not the name. 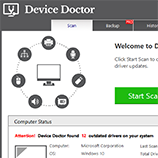 Device Doctor downloads driver files through your web browser to your default download location. If you're experiencing any problems with downloading the driver files themselves, try downloading a test file from another site. If any other downloads work, Device Doctor ones should too. If your problem persists, ask for help in the forum. There are too many drivers for Device Doctor to offer on a list. If you're looking for a driver for a printer, scanner, or any other external device, make sure it is plugged in before you begin the scan - Device Doctor will then see it and should be able to find the correct driver. If not, seek help in the forum.